The technology of sintering in its most basic form is very simple and has been in use since early twentieth century. However, while the basic technology is simple, control of the process relies on a number of extremely complex interdependent process parameters and requires a thorough understanding of the effect of these parameters on production capacity and sinter quality. The sintering technology is basically an agglomeration process for the iron ore fines which is dependent on heat to melt the surface of the smaller particles together to form larger agglomerates. A typical sinter plant consists of a number of sequential operating units with the sinter machine at the heart of the plant. The simplified process sequence is as follows. Raw materials consisting of iron ore fines, coke breeze, slag modifiers such as lime stone, dolomite, manganese ore, lime, quartzite, and sand etc., and waste materials such as mill scale, screenings, dusts, sludges, and converter slags etc. are batched and conveyed to a blending system. The raw materials are blended in a rotating mixing drum after addition of sinter return fines and water to achieve a green feed for the a process. The mixing process is normally referred to as ‘nodulizing’. The nodulized green feed is charged to the strand of the sinter machine on top of a sized hearth layer to form the ‘sinter bed’. This bed passes through the ignition furnace (hood) to initiate the reaction. Burners in the hood ignite the carbon in the green feed charged in the form of coke breeze. The reaction is propagated by chemical reaction between the carbon and the air sucked through the sinter bed by the exhaust fans. The sinter burns through vertically while the bed moves horizontally towards the discharge end. The sintered material is discharged through a hot sinter crusher onto a sinter cooler, where ambient air is blown through the crushed sintered hot material from below. After cooling, the sinter is conveyed to a crushing and screening section where it is sized and finally conveyed either to the stock house of blast furnace or to the sinter storage. Sinter machines which are normally being used are straight line machines for large sinter plants and annular machines for small sinter plants. Exhaust gases are usually cleaned in cyclones and electrostatic separators before they are discharged to the atmosphere. In addition to all other demands, the design of a modern sinter plant with a strand type sinter machine is to meet the requirements of raw materials preparation and handling as well as product sizing and handling along with reasonably sophisticated controls and instrumentation. Superior homogeneity and high permeability of the sinter raw mix are decisive factors in achieving high sinter productivity and quality with reduced consumption of energy. After being cooled, the sinter product is sized in the crushing and screening section. There the cooled sinter material is downsized to be used in three different applications namely (i) return fines to the sinter process, (ii) hearth layer, and (iii) for use in blast furnace burden. The small grain particles are recirculated back to the sinter process, the mid-sized particles are generally used as hearth layer for the protection of the pallet cars, and the larger-sized particles are conveyed to the blast furnace. 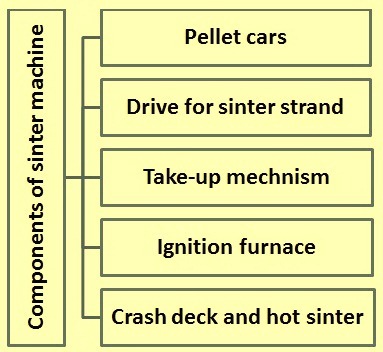 The sinter machine proper remains the core of the sinter making technology and has the main components ( Fig 1) namely (i) pellet cars, (ii) drive for sinter strand, (iii) take-up mechanism, (iv) ignition furnace, and (v) crash deck and hot sinter crusher. The outlines of the design requirements and engineering approaches for these components of the sinter machine are described below. The pallet cars convey the green feed material along the machine strand and above the wind boxes (where there is negative system pressure) while the sintering process of the green feed material is taking place. The sinter strand consists of several pellet cars and can be regarded as an unlinked endless chain because of its motion. Due to it, the pallet cars are subject to stresses resulting from the following. Exposure to cyclic thermal variations due to the high temperatures experienced on the sintering (upper) side of the strand and cooling of the cars taking place on the return side (lower) of the strand sections. Exposure to cyclic static loads from the mass of the green feed/sinter. Exposure to cyclic dynamic loads from the forces imparted by the drive sprockets, as well as by the pallet cars against one another. Though the development of the strand type sinter machines and the materials for their components have been going on for well over a century, the fact remains that the above mentioned demanding duty results into the fatigue of the most suitable materials (nodular, flake graphite, and white cast iron etc.) within a limited number of cycles. Hence, many of the sinter plants usually make replacement plans for the pellet cars based upon an average service life of 10 years, at somewhat less than 330 days per annum. The choice of materials and shapes of the components of the pallet cars is further determined by the requirements namely (i) minimal pressure drop through the grate bars, (ii) maximum abrasion resistance of the grate bars, (iii) maximum ductility and abrasion resistance of the cheek plates in respect of sliding motion of green feed and sintered material against same, and (iv) quick replaceability of worn out or otherwise unserviceable components by the personnel who are not fully skilled. The pallet cars, which are not linked, are pushed along the top strand of the machine’s frame by the drive sprockets, which are fitted with shrink-discs on a common shaft. The sprockets are usually equipped with replaceable tooth segments, precision-cast from special steel. The teeth impart a rolling action upon the inner wheels of the stub axle assemblies, of which four are attached to each pallet car. The outer wheels of the stub axle assemblies serve to guide the pallets at their return points, i.e. at the drive and discharge stations, while the inner wheels carry the static and dynamic loads as the pallets are pushed along the strand. The drive of the sinter strand is usually not placed at the discharge end of the strand, for the reasons of heat and maintainability. Prime mover choices available are (i) electro-mechanical, with variable speed drive, or (ii) electro-hydraulic, with variable displacement pump or motor. It is possible to use either dual or single drives. The main reasons in the selection of drives and drive arrangements are (i) reduction of overhung loads, by use of shaft-mounted planetary gear-boxes, (ii) speed range, and (iii) the maintainability. Take- up mechanism is provided for compensating the differential thermal expansion between the moving pallet cars and the frame along with the rails and wind boxes of the sintering machine, while maintaining adequate pressure to avoid separation of the pallet body faces. Take-up mechanisms are generally automatic by means of counterweight/pulley systems, or with hydraulic system. The benefits of a hydraulic system are (i) minimum pressure can be maintained to reduce frictional wear between the pallet body faces, and (ii) replacement of single pallet assemblies (opening the strand) is facilitated by the use of a double-acting cylinder (or cylinders). Machine builders for valid technical reasons usually provide for the strands of large machines, the take-up mechanisms which are located at the discharge end of the strand. But for strands of smaller machines, it is more feasible to provide the take-up mechanisms at the cold drive end. In either case, the respective mechanism is to be designed as a mobile unit, either mounted on a wheel/rail arrangement, or suspended from it. An accurate guiding mechanism, which allows alignment of the drive station on the centre-line of the strand, is necessary. Ignition furnace in a sinter machine can be described as refractory lined steel box, in which two or more horizontally opposed burners are arranged. Any kind of fuel, like gaseous fuel (coke oven gas, blast furnace gas, mixed gas, or natural gas etc. ), liquid fuels, or solid fuels (pulverized coal) can be used as heat source. Vertically operable doors shut off the faces of the ignition furnace down to the top level of the green feed, in order to minimize heat losses. The purpose of the ignition furnace is to ignite the upper layer by igniting the carbon of the coke breeze in the green feed. For meeting the above requirements, the ignition furnace is to be equipped with the following features. The flame of the burners is to operate with low velocity so as to avoid disturbance of the green feed bed. A flame of flat shape is advantageous for fast and even ignition of the green feed. Suitable provision is essential so as to get the controlled supply of cooling air to the burners in order to achieve the desired flame temperature. There are to be available adequate burner controls which are easy to operate. All furnace controls are to be fail-safe. Pilot flames are to be reliable, e.g. if the burners are operated with gas of low and/or fluctuating calorific value, like blast furnace gas or mixed gas, then the pilot flames are to be operated on liquid petroleum gas (LPG). The crash-deck is provided to guide the hot sintered material, as it is discharged out of the pallet cars, into the hot sinter crusher which is also sometimes called ‘finger crusher’. As the crash-deck is subject to severe impact and abrasion, it is heavily lined. In some machines, the crash-deck is lined with ceramic cubes. The life span of these liners is to match the annual scheduled plant maintenance periods. In case of smaller capacity sintering machines the lining of the crash-decks is usually done with hardwearing plate, or even with the cast slabs of hard wearing materials which are normally considered as adequate. The hot sinter crusher reduces the lumps of sinter cake to a size smaller than 150 mm, in preparation for cooling and secondary crushing. Since the sinter cake retains a temperature of around 850 deg C at the time of leaving the strand, the hot sinter crusher operates in a very hostile environment. Hence the design of the hot sinter crusher is to take care of this hostile environment. This issue is taken care with the following design features such as (i) exchangeable fingers/finger-wheels, (ii) shielded bearings, (iii) water cooled shafts (on larger sinter machines), and (iv) quick replaceability of complete shaft assembly, including fingers, bearings and bearing shields. This demands the facility for easy removal of the dust canopy, as well as easy disconnection of the crusher drive. The sinter cooler often becomes the bottleneck of the sinter production, with outdated technology leading to low productivity and high operation and maintenance cost. Normally annular cooler is used for sinter cooling. In some sintering machines straight line coolers are also used. The design of the annular cooler is now essentially composed of a rigid ring frame construction for easy and sustainable material centering. The advanced design of the cooler charging chute ensures a more homogeneous distribution of the sinter onto the sinter cooler, keeping pieces with larger diameters near the bottom and the smaller at the top. This increases cooling performance, reduces fan power consumption, and prevents damage to the associated equipment. The cooler has special rubber seals between the moving cooler trough and the air-channel system that produce a more efficient utilization of the cooling air. To further improve sinter plant energy efficiency, a number of different types of heat recovery systems are installed at the sinter cooler, where the sensible heat of the off-air is used to generate electric energy or process steam. There are three possible heat-recovery alternatives which are generally employed. These are (i) preheating of combustion air for the ignition furnace and post-heating of the freshly ignited sinter, (ii) selective waste gas recirculation system, providing coke and CO2 (carbon di oxide) conservation, and (iii) waste-heat recovery plant for steam and/or electric power generation. Normally the testing while designing sintering plant has threefold objective. The objective includes (i) to confirm certain pre-selected process parameters based on the existing similar sinter plants, (ii) to assess the selected parameters in terms of proposed production capacity of the sinter plant, and (iii) to obtain design information specific to the proposed sintering plant. Changing parameters such as percentage of coke breeze addition and to a lesser extent also percentage of water addition is normally used to reach an optimization point for a set of operating parameters. If the set of conditions are chosen adequately close to target, optimization is judged by the ‘sinter fines ratio’ (weight of fines generated / weight of fines returned to green feed) which is required to be as close to 1 as possible (a sinter is considered to be good if the ratio is between 0.95 and 1.05). If water and coke breeze variations fail to achieve the sinter fines ratio then it can only be further optimized by changing the sinter fines input to the green feed mixture for a set bed depth and pressure drop (suction). The following process parameters are normally initially identified for straight line machines and set at the indicated, pre-selected values for the testing. The testing alternatives are generally chosen based on projected operating requirements of the proposed sinter plant. Some of the suggested alternatives are (i) the base case consisting of only ore fines without the addition of dusts or sludges, (ii) with certain percentage of dusts and sludges added to the ore fines but without nodulizing, and (iii) with certain percentage of dusts and sludges added to ore fines but this time pre-nodulized prior to mixing with the ore fines. Water is added to the sinter mixture for a variety of reasons, the most important being the propagation of agglomeration of fine dust onto the larger particles during the nodulizing process. This together with nodulizing time plays a pivotal role in the control of the permeability of the sinter mixture and consequently the sinter cake. However, it also influences the quality of the sinter cake (cold strength) and the production rate, yield and sinter fines ratio. Hence, there is the necessity of moisture control during the process of sintering. Normally when the water addition rates are high then higher energy is needed during the sintering and when water addition rates are lower than needed then the proper nodulizing does not take place. Hence water addition rates need to be optimized through testing. Due to this reason, control of the optimum water addition is critical for stable operation and adequate provision for this is required to be made during design. However, the water addition is a parameter which can be easily further optimized during commissioning of a full-scale plant. The sintering reaction is propagated by smelting of the surface layer of individual particles of the ore fines and fusing them together. The heat (energy) available for this reaction is controlled by the reaction between carbon of the coke breeze added to the sinter mixture and oxygen from air sucked through the bed. The interaction between these two parameters is complex and plays a big role in determining the process outputs i.e. production rate, yield, sinter fines ratio, and sinter quality for a given set of the fixed process parameters. It is important to note that none of the different process parameters (pressure drop, yield, production rate, ignition temperature, and coke breeze addition etc.) are totally independent from each other. However, the amount of carbon in the form of coke breeze added to the green sinter feed is possibly the most critical to control since it determines the behaviour of the bed during sintering and also influences the cooling properties to some extent. Typically, with too much carbon in the sinter mixture, the bed is fused too far and starts to close up, preventing air flow through the bed for a fixed pressure drop. This in turn leads to long sintering times and low production rates. In contrast, too little carbon in the sinter mixture prevents adequate sintering and increases the amount of return fines from the process, at the same time lowering the yield. Testing is the best way to determine the optimum percentage of carbon (coke breeze) needed for the optimization of the sintering process. During the testing being carried out for the design of the plant, a set of parameters is chosen based on the best available data for the specific green sinter mixture. The amount of coke breeze added to the feed is varied and the effectiveness of sintering is judged by the amount of fines (minus 5 mm fraction) produced by the process (essentially unsintered materials). Depending on the ratio of input to output fines, the amount of coke breeze is adjusted. As earlier stated, propagation of the sintering reaction is controlled by the amount of carbon (coke breeze) and air in the system since it provides the energy for reaction. However in sinter machines, it is both difficult and impractical to control the airflow through the bed and hence, pressure drop is controlled rather than airflow. The amount of air sucked through the sinter bed is dependent on the permeability of the sinter mixture in the bed for a specific pressure drop and hence it varies along the length of the sinter strand due to changes in permeability. Pressure drop through the system is kept constant at a predetermined level by suction created by the gas cleaning system exhaust fans. Control of individual suction boxes is possible online but not necessary, except for those under the ignition hood. Ignition takes place at around 180 -200 mm WG, largely independent of the bed depth, but sintering pressure drops are linked to bed depth. Practically, there are a multitude of sinter plant configurations possible for any given production rate though varying the width, length or depth of the bed which has though slightly different impact. The major effect of a deeper bed is due to the relationship between surface area and volume of sinter produced. With increasing bed depth, the ratio of volume to area increases and hence lesser unsintered surface fines are expected. This normally impacts on yield and sinter fines ratio, but not necessarily production rate. As a rule, provided that the pressure drop is adjusted, production rates are not affected because at a fixed vertical sintering velocity (speed of burn through the bed also known as flame front speed) it requires a proportional amount of time for differing bed depths. However, it may impact on the horizontal speed of the sinter strand since the burn through point shifts with sintering time. It is normally seen that the sinter mixture performs noticeably better with the deeper bed. Sinter fines ratios and strand speeds for the deeper bed are much more acceptable while maintaining the required production capacities. An added benefit of the deeper bed is in the coke breeze consumption, which drops substantially. Also it is generally seen that with the increased bed height, some flexibility exists in terms of the pressure drop required through the bed. Ignition of the green sinter feed is by burners fired on possibly with any source of fuel. Ignition time is not considered to be a critical parameter as long as the coke breeze in the top layer is sufficiently ignited to propagate the reaction further through the bed. Depending on the ore source, the ignition time may vary from 0.5 to 2.0 minutes, but normally an ignition time of 1.5 minutes is thought to be sufficient. Contrary to ignition time, ignition temperature is normally considered as critical. The temperature during ignition controls the quantity of the top layer and as a consequence also the yield of final product from the strand. In addition, it can also influence the quality of the final product (strength), product yield and production rate. Further, it has been often observed that thermal shock from too high ignition temperatures leads to crack formation across the sinter bed where short-circuiting of airflow usually happens. In areas adjacent to these cracks, incomplete sintering take place which is considered to be the major cause for lower yields, lower production rates and poor quality sinter. However, it is to be noted that that the temperature of ignition and energy required for ignition are not the same and are not to be confused with each other. Further, these two parameters are ideally to be individually controlled which is normally difficult in a sinter plant. The hearth layer has basically one non-critical function which is to prevent the damage to the pallet cars and grid bars caused by sintering of the cake to the hearth. It has been seen that some sinter mixtures made from specific low-grade iron ores do not even require a hearth layer. Normally very slight effects of hearth layer thickness and size distribution on the permeability of the sinter cake are expected but they remain insignificant for all practical purposes. However, there is one apprehension which is there during the sinter plant operation is that there can be a difficulty with the continuity of supply of the recirculating hearth layer. Sometimes there are not enough quantity of the correct size range which is available to supply the hearth layer. In such a case there is a necessity to control the sinter crushing downstream in the sinter process. The yield of a sintering process is expressed generally as the amount of sinter produced as compared to the amount of raw materials fed into the process. Depending on the battery limit of the calculation, (strand end or final product) the result of the calculation may be different. The strand end yield only indicates losses due to LOI (loss of ignition) and dust sucked through to the exhaust gas system while the final product yield also take into account the generation of the fines fraction ( less than 5 mm). Based on the analysis of the input materials, an LOI of around 20% and a strand end sinter yield of 80 % are usually expected. The production rate or production index has become the norm by which the capacity of a sinter plant is judged and is usually expressed as the mass of sinter produced per square meter of active hearth area per hour. In some places it is expressed as the mass of sinter produced per square meter of active hearth area per 24 hours. However, there can be some confusion concerning the definition of active hearth area as well as the battery limit (strand end compared to final product) is possible. It is therefore practical to define the terms as follows. The battery limit for the mass of sinter produced is after the final product screens and therefore it excludes those fines which are recycled to the green sinter feed and ignores the hearth layer fraction, which is considered to be a continuously recirculating load. The active hearth area is defined as the total area available for sintering from the start of the ignition hood inlet to the burn-through point. It is required to be understood that if a specific type of ore burns through quicker than another on the same strand, it does not automatically mean that the production rate is higher. The strand speed is required to be adjusted to push the burn-through point to the end of the strand in order to increase the active strand area. This in turn increases the production rate. Sinter fines ratio is the parameter which determines the performance of the sintering process. Hence it is sensible to say that the ideal is to aim for a ratio of 1 at which point the amount of fines generated is equal to the amount returned to the green feed and the process is in equilibrium. In sintering process the sinter fines ratio is generally allowed to vary between 0.95 and 1.05, necessitating the need for buffer storage.